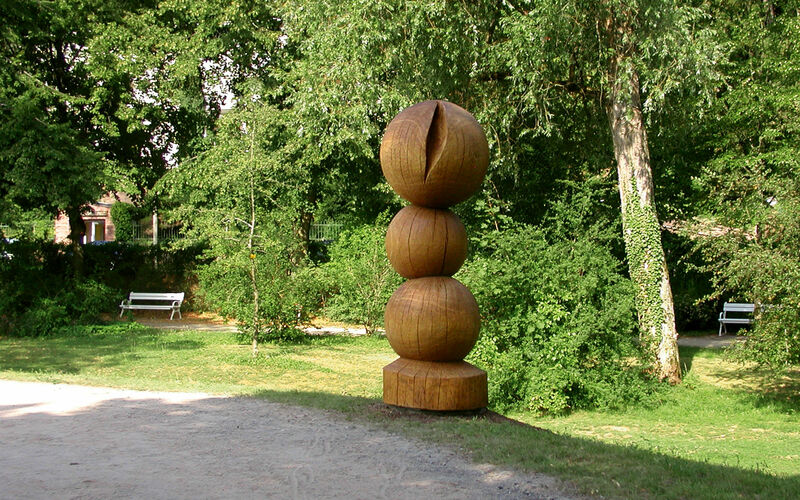 The ‘Weg der Besinnung’ (Path of reflection) with twelve works of art by the artist Helmut Droll begins at the Heiligenhof and runs along the edge of the woods for about 2 km towards Garitz. Works like the sphere sculpture ‘Im Lot’ invite you to try taking a new perspective on the world and on life. There are information boards about the individual works. There are also guided tours as part of the ecumenical pastoral care. Information and dates at the tourist office. The ‘Salzweg’ (Salt Route) connects the former salt production sites of the ‘Untere und Obere Saline’ (Lower and Upper Saltworks). The ten stations provide additional information on the exhibition in the ‘Museum Obere Saline’ about the individual stages of salt production and the significance of salt and brine for the history of Bad Kissingen as a spa. A map and brief information are available at the tourist office. artists from Italy, Japan, Austria, Hungary and Germany have created a dialogue of water and stone from Franconian shell limestone – an allusion to the significance of water for the development of the town of Bad Kissingen. Information boards provide information about the artists and their works. Using ‘Denkmalroute’ (Memorial route) as a motto, three multi-media based exploration routes lead you through Bad Kissingen. In the ‘Historical Town Centre Tour’, the remains of the town wall, the marketplace with its renaissance Town Hall and the many aristocratic residences allow you to immerse yourself in hundreds of years of the town’s history. The ‘Littmann Tour’ allows you to follow the many different architectural traces that the renowned art nouveau architect Max Littmann has left behind in Bad Kissingen since 1904. And with the help of an exciting story, the ‘Children’s Church Tour’ tells our younger visitors what it used to look like here. All of these stations have QR codes. Simply scan these and you can see interesting photos directly on your smartphone. In the tourist office you can get a flyer with detailed information about the three routes and if you present your guest card, you can borrow a media guide.